When creating websites using React, a router package will need to be installed so that the React application can handle requests within the browser. In order to go about using React Router v4, the react-router-dom package should be installed. For simplicity, routing will be added to the create-react-app application. To start with, create the React application by running the following command. 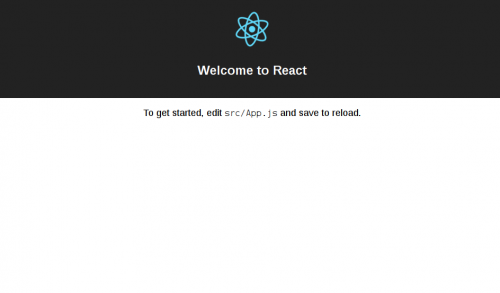 The above commands will create a React application within a reactapp directory. The React application can be started by cd‘ing into this directory, and running npm start. The application should then be running locally, and you’ll hopefully see the following page within the browser. As mentioned earlier, the react-router-dom package needs to be installed to handle the application routing. Therefore, cd within the reactapp directory, and run the following command. Within the React application’s src/index.js file, import the BrowserRouter component from react-router-dom near the top of the file. BrowserRouter is used for web-based application that run on React. There is also a HashRouter for static websites. The BrowserRouter component requires a single child element in order to make use of the routing capabilities. Since routing will be often used throughout the application, it is common for the <App /> element to be wrapped within <BrowserRouter>. The index.js may look like the following. Edit the file and wrap the <App /> element within a pair of <BrowserRouter> nodes. The second step will be to define a component that will be used to render content from different routes. Navigate to the src/App.js file and you should see the following content. Amend the file to look like the below. You’ll notice that a Header and Main component are rendered within the return statement. <Main> will contain the content for different pages when their route is requested in the browser. Here’s how an example Main.js component looks like. As seen above, the <Switch> and <Route> components are used to map components to the route requested. So if the /about route is requested, the About component will be used and the content returned within the component’s return will be rendered. The components will be used if the route’s exact path is matched, however you can use just path. This is useful if you have a several pages that render similar content, like a blog. Routes such as /blog or /blog/2 would match the following definition. Now add the components defined within Main.js. In this example, the Home.js might contain the following code. The last step involves adding the navigation enabling a user to click on the links to render the content within the components. Add the Header component defined within the App.js file, and add the appropriate links. Amend the app.css stylesheet so that the navigation links are clearly visible, and you should be able to successfully navigate around the React application. There are of course more complex examples of routing that you may be curious about and are not covered in this post, but it should provide a basic overview of how to go about using React Router v4 within a React application.